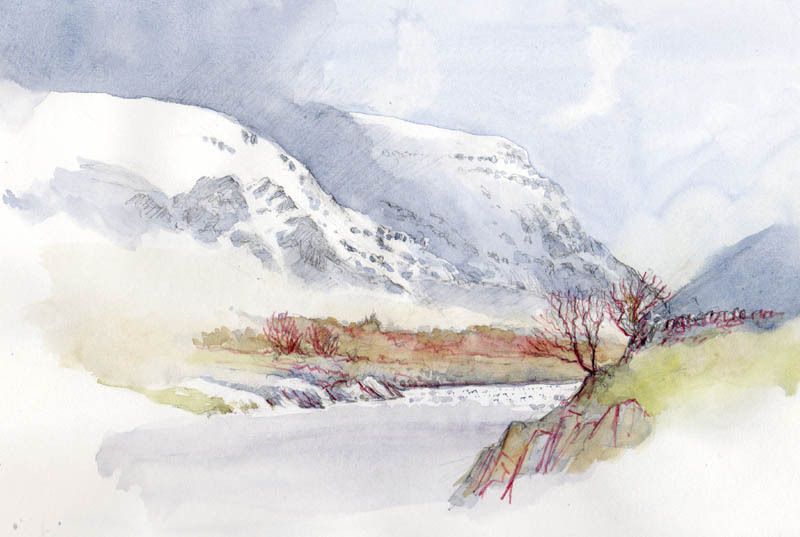 This entry was posted in David Bellamy, Inktense Pencils, Sable Brushes, sketching, Sketching in winter, Sketching Landscape Composition, sketching outdoors and tagged Inktense Pencils, Rosemary & Co by David Bellamy. Bookmark the permalink. Thanks for the lovely blog ….. always a joy. I think I will explore your suggested brushes. I have bought these in the past and I need a new one ! It just goes to show there is do much in these islands of ours that compare, albeit in different ways, with anywhere else in the world. Thank you. I actually love Rosemary’s brushes and have used them for many years and have found that not only do they have a fine point but they keep it much longer than most other makes. Glad you had a good experience with the varying light and position. Are you going for a composite painting or two individual ones ??? Timely for me, as Snowdonia is my destination after your course in July. I always learn something from your blogs. Thanks!